After spending the last week on a sale in Saint Petersburg, I have been thinking about what the primary crusing spots are in South Florida and the differences between them. I know Fort Lauderdale best, home base of my office. Other locations on my list include Stuart, Miami, the Keys, and Tampa Bay. There is a surprising variation in culture, geography, and service sophistication that leads to a distinct class of yachts dominating each area. Clockwise from the Atlantic to the Gulf side are the following spots. I include the cities Hobe Sound, Fort Pierce, Vero Beach, and Stuart in this area. Here you will find less expensive dry storage and wet slip rates along with a rural atmosphere. These rates attract smaller sailboats and trawlers. The primary landmarks are North and South Hutchinson Island. There is water everywhere though much of it shallow. Yards of note include Crackerboy, Harbourtown, and Riverside. During hurricane season these are packed with sailboats ten deep. Once a wooden sailboat haven and similar to the current Stuart area, Fort Lauderdale is now home to the largest and highest end yachts in South Florida and some might say the world. The Fort Lauderdale International Boat Show around Halloween is a showcase for the megayacht industry. The unique geography of the area includes the New River, the Dania Cut-off Canal, Port Everglades, and a long stretch of the ICW. The area is teeming with support groups. 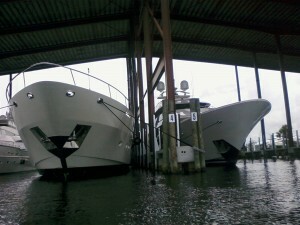 Mainly yachts are worked on or stored here for jumping over to Bimini or down to Tortola. I include all waters from Lighthouse Point to Hallendale in this area. Go any further south, and you will need to be billingual. Bienvenidos a Miami, once the primary yachting area, has more of an island feel these days with merging Haitian, Cuban, and Bahamian cultures. This led to the old school yachtsmen evacuating to Lauderdale. 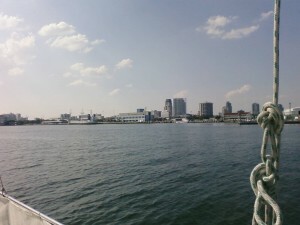 Miami features Biscayne Bay, a large calm water body which makes it a much better sailing spot than Lauderdale. The historic Miami River, much in need of renovation, still feeds a lively marine industry of smaller sportfish boats. Rickenbacker Marina on Key Biscayne is a high end spot to take advantage of day sailing or water sports on Biscayne Bay. The Miami Show in February is an excellent show to compare catamarans. The shallow Florida Keys is a paradise for diving and fishing. Locals are a special group, and you will find many liveaboards living out their retirement dreams in this laid back Key West world. Hemmingway is a hero here. The beer and seafood is excellent. Skipping the area of Naples and Punta Gorda, Tampa Bay features a midwest mentality and home base for a large sailing population. The winds are light at 5 to 10 knots and the bay waters calm. The humidity is much less at 30% compared the 90% humidity on the Atlantic side. 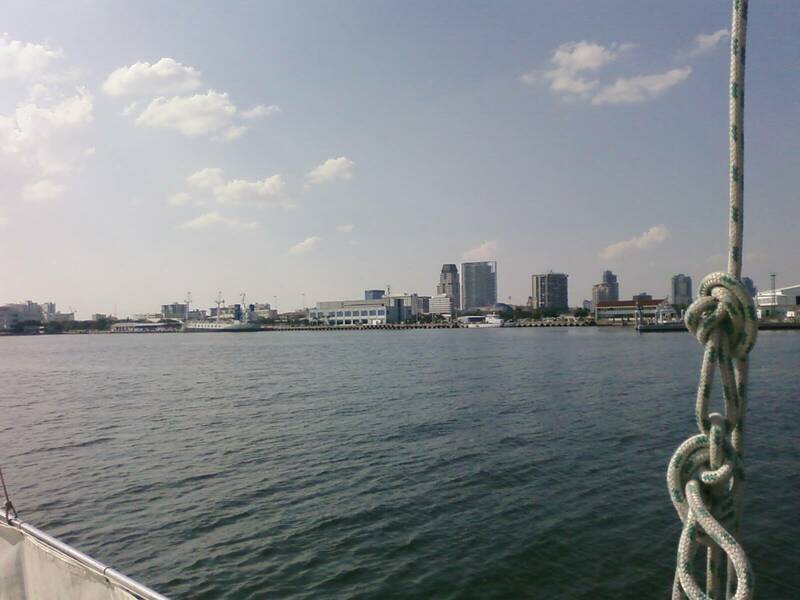 If you are looking to charter or get sailing instruction Tampa Bay is a perfect location. The waters are shallow so keep the larger yachts away. From Stuart around to Tampa Bay, above are some notes on the common weather, geography, and vessels that populate each location’s waters. As you continue further north in Florida, there are many rural areas along the Space Coast such as Saint Augustine and along the panhandle such as Green Cove Springs where cruisers congregate. Your home base location is determined by (1) the type of fun on the water you like whether it be fishing, day sailing, or diving and (2) the type of culture you are comfortable in whether rural, luxury, tropical, laid back, or mid-west. They are good spots all around. Please feel free to post your favorite South Florida cruising location or other feedback in the comments below.